Veterans Day 2016 was a very busy time for Mollie’s War as we crisscrossed through the Chicago land area from Olympia Fields to Huntley and all places in between. We talked with 4 and 5 year old children at a preschool in Elmhurst as well as 90+ year olds who served in WWII. Everyone had a story to tell whether it was the woman who talked about her parents who both decided to enlist. Her mother was accepted but her father was not–then they had to get her mother out of her enlistment. There was the gentleman who served in both WWII and Korea. The gentleman who served in WWII and talked about his father serving in WWI and being in the forest area in Northern France when the Armistice was signed on November 11, 1918 ending WWI. All in all it was a very meaningful time for Mollie’s War. The online book club of the 1st WAC Separate Battalion, Headquarters Company invited me to hangout at their first book club meeting to discuss “Mollie’s War” using “Google Hangouts.” It was my first time using Google Hangouts but so much fun. There were lots of good questions and comments. I so appreciated it as they said–Mollie was a huge inspiration for the creation of this group. Meeting a group of women committed to sharing the story of the WACs by reenactment was awesome! 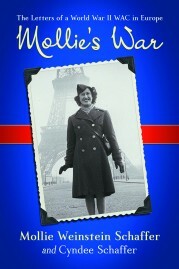 Today, July 19, would have been my mother, Mollie’s, 100th birthday. It would have been a very big celebration! We miss you and love you so much! Thank you for everything that you did for all of us.